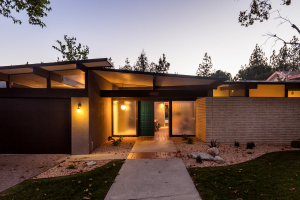 Enjoy peace and serenity in this three bedroom, two bathroom atrium style Mid-Century home in La Canada Flintridge. Built in 1963 by local architect/builder Webster Wiley, the alluring architectural layout includes sunlit rooms that open to a central atrium. The home has been recently remodeled throughout with thoughtful attention to every detail. With Mid-century appeal throughout, the adjoining living room and dining room boasts exposed wood beamed ceilings. The bright kitchen opens to the family room with fireplace and sliding doors to the backyard for indoor/outdoor living. A common hallway leads to the three bedrooms and two bathrooms, including the master suite. The expansive professionally designed backyard includes a large grassy yard, play house and mountain views. The property is located in the Sagebrush area and offers Blue Ribbon La Crescenta Schools.